As I announced in my New Film Resolutions post, which is a list of films I want to watch in 2017, I am going to be writing about my initial thoughts and feelings towards every single movie on the list. This is an anual project, so definitely go and check out the list to see if you're interested in reading more in the future or if you just want to discover some new movies. 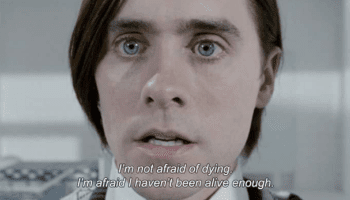 Here's the thing: when I first saw Mr. Nobody I didn't know what to expect. I didn't know what it was about. Instead of reading reviews beforehand, I decided to jump in blindly and it was the best decision I could have made. 'We are all just in the mind of a little boy face with an impossible decision"
I know what you're thinking. Jared Leto? Really? YES, REALLY. I was just as surprised as most people, but I spare no praise when I say that his performance was outstanding. And trust me when I say, not only his acting, but the whole film was incredible. It's not often that I lable something as 'masterful' - Mr. Nobody comes pretty damn close. And although it has its flaws, I am happy to overlook them simply because this film is unlike anything I have ever seen before. First let me clarify that there are scenes in the past, present and future. The image above is a still of the future in the year 2092. The visuals regarding the futuristic world are amazing. I would even dare to name this movie as a visual masterpiece of the modern day and age. Now let me set the scene: Tall buildings, strange looking people, an old man who is confused about his past life. Mr. Sandman, the song. That is one of the soundtrack songs and they couldn't have chosen a better track to represent the whole movie. I am not going to try and explain the plot, it's very complex and generally just better if you give it a go without knowing too much before. I confess that I am certain that my short summary could never represent the level of thought that must have gone into writing the script and producing/directing the movie. It would simply do it no justice - it's pointless. What I can do is rave about it because this thought provoking movie is a creation that not enough people know about. 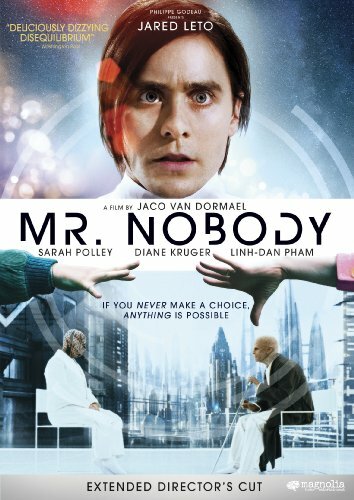 I'm not even sure if Mr. Nobody is something I would describe as a "film/movie" - it was more like an experience for me because it required, even demanded that I give it my full attention while drawing parallels to my own life and experiences, my own hopes and dreams. I have never finished a film feeling different. Sad, yes, but never like I was a changed person. I felt like I had learned something, my eyes were opened. The film, though surreal and dreamy, made perfect sense. Now let me address about the romance: when I first realized Mr. Nobody focused on romance a lot, I started to dread the outcome. It was off to such a great start...! But once again, I was blown away by the different style of narrative, because it's not the traditional way of telling a story. I loved the visual parallels between the past and the future. I enjoyed seeing the process of a boy growing up. I liked the romance because it was not your classical Hollywood. The romance scenes were mundane scenes, I even found the dialoge to be cheesy at times, but who could blame a puppt-eyed teenager? The thing is that the romantic scenes gave me a break to process the more complex and intense happenings. They created a contrast that set the whole tone of the movie. A captivating story about love, dreams and simply life. Because the concept of time is non-linear, I was feeling anxious about how they would capture it in a way that wasn't confusing for the average viewer. But surprisingly, the timeline was mostly cohesive and I found myself not minding if I was shortly confused, as it just made me connect to Mr. Nobody more. I understood how the hundred year old man must be feeling in that room. The transitions between the different timelines were smooth and brilliantly implemented. "Every path is the right path. Everything could've been anything else. And it would have just as much meaning." Overall I recommend everyone see this film although I can guarantee that not everyone will like it. It has a certain tone to it that not everyone will appreciate in the same way. Nevertheless, it provokes thoughts and gives a visually stimulating story with ultimately one question hanging over it like a could: "What if?"